You’ve heard it before – breakfast is the most important meal of the day. But, it can be easy to fall into a breakfast rut of cold cereal or white bagels. 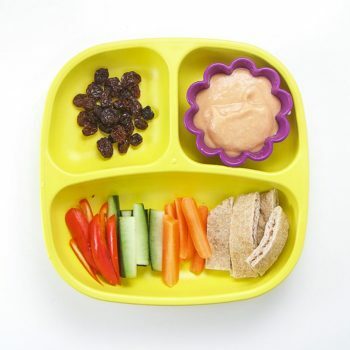 If you want to send your kids (and yourselves) off for the day with good nutrition to keep energy levels high and appetites in check, you need realistic ideas that are quick for you, and tasty for your kids. Use Beech-Nut Naturals just mango jars to make mango-loaded pancakes and tropical overnight oats. These recipes have you covered with time, taste and nutrition – they are rich in whole grains, fiber and protein, and low in sugar, using mango as the main sweetener. The beauty of these recipes is that they eliminate the need for morning baking or cleaning. The overnight oats are no-cook and meant to be made the night before (your kids can help make them with you), and the pancakes, if made in advance, refrigerate (up to 2 days) and freeze (up to 1 month) well. If you are feeling ambitious, I’ve provided the recipe below for making the mango purée from scratch. Beech-Nut has labeled its mango jars as a stage 2 food, which is generally recommended for little ones around 6 months in age. Once the purée is turned into overnight oats or pancakes, I recommend waiting until your baby is eating chopped, moist table foods, which is usually around 9-10 months. As always, trust your instincts and you can always consult your pediatrician before starting a new stage of food. In a large bowl, combine the flour, baking powder, baking soda and salt. In a medium bowl, add milk, lemon juice, egg, vanilla, maple syrup and 2 tbsp melted butter. Whisk until bubbles form. Gently fold in mango purée until evenly mixed. Pour the wet ingredients into the dry ingredients, gently mixing to combine. Pour batter into a spouted liquid measuring cup for easy, spill-free pouring. Generously grease grill pan or skillet (preferably cast iron skillet) with butter and heat to a medium-high heat. Once the pan or skillet is hot, pour batter to form medium-sized pancakes. Cook 2-3 minutes on each side, or until golden brown. This recipe is loaded with fiber and healthy fats made with superfoods, like coconut and chia seeds! In a bowl, combine oats, chia seeds and coconut. Stir until combined. In a separate bowl, combine milk, vanilla and mango purée. Mix well to prevent mango from sinking to the bottom. Take a jar or container (mason jars work well) and add the dry ingredients followed by the milk and mango mixture. Mix a few times to evenly distribute the ingredients. Place lid on the jar and refrigerate overnight. Feel free to swap out the coconut for other nuts or seeds like slivered almonds or toasted pumpkin seeds. The key to making mango purée from scratch is to choose very ripe, soft and sweet mangoes. Harder mangoes will not blend well. If you can’t find good quality mangoes, head to the freezer aisle and grab a bag of chopped frozen mango. Add water to a medium pot (I used 8 cups of water for 6-quart pot) with steamer basket or tray. Cover with lid and bring to a boil. Once water is boiling, add mango, cover and steam for 3-5 minutes until easily mashable with a fork (softer mangoes will need 3 minutes, harder mangoes 5 minutes). Place steamed mangoes in blender or food processor. Blend until desired consistency is reached. For stage 1 (recommended beginning at 4 months) and first bites, blend for 2-3 minutes until completely smooth and add 1-2 tbsp of cooking water for a thinner consistency. For older babies (6+ months) blend for 1-2 minutes for a chunkier consistency.